Sensafe for your aquarium water quality needs. SenSafe Aquarium Products ensure that your aquarium water is safe, clean, and free of harmful chemicals and contiminants. 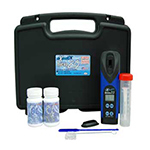 In less than a minute and a half, you can discover if your water has dangerous or high levels of nitrate, nitrite, hardness, alkalinity of pH using SenSafe's Eco-Check 5 in 1 Test Strips. 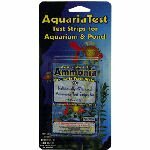 SenSafe's AquariaTest Test Strips allow you to test the level of ammonia in such freshwater settings as an aquarium or pond. Ammonia poisoning is a leading cause of fish death, and it can be avoided with this simple kit.